This egg won't stay hidden for long! This classic Swiss milk chocolate Easter treat is filled with a buttery, white chocolate and coconut ganache. 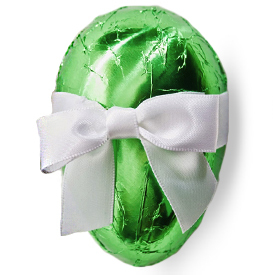 Dressed for Easter in light green foil and finished with a white bow. White Chocolate (Sugar, Cocoa Butter, Milk Powder, Soy Lecithin, Vanilla), Butter, Dried Coconut, Milk Chocolate (Sugar, Cocoa Butter, Whole Milk Powder, Cocoa Mass, Lactose, Skim Milk Powder, Barley Malt Extract, Soy Lecithin, Vanilla).